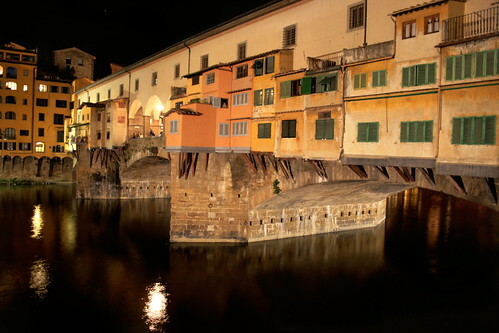 Returning to Florence this year we really wanted to spend more time taking night shots around the city and to spot a coypu, the 'big rot' which had so far evaded us. Last year we were blessed with the most fabulous view from our hotel (purrr, The Balestri, what a beautiful hotel!) and enjoyed hanging out the windows to take photographs of the river at various times of the day and night. However, this did mean that we didn't have very many night shots of anywhere else around the city. This year we stayed at the Hotel Ginori al Duomo, which was more centrally located and, whilst not quite as fancy as the Balestri, the building, the welcome, the beams and the giant breakfast served to our room every morning were all excellent! With several more to come! 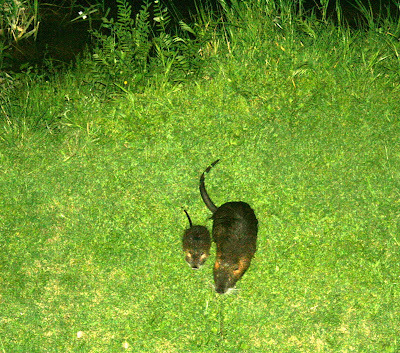 Oh, and we finally did spot some coypu! Apologies for the terrible photograph: I was somewhat dangling over the river and it was very dark! I love the lights in the first one -- were you using a filter to get the effect or did it just happen? Either way -- very pretty. Thanks Donna, no filter on the lights, just a bit lucky to be high up after the rain.